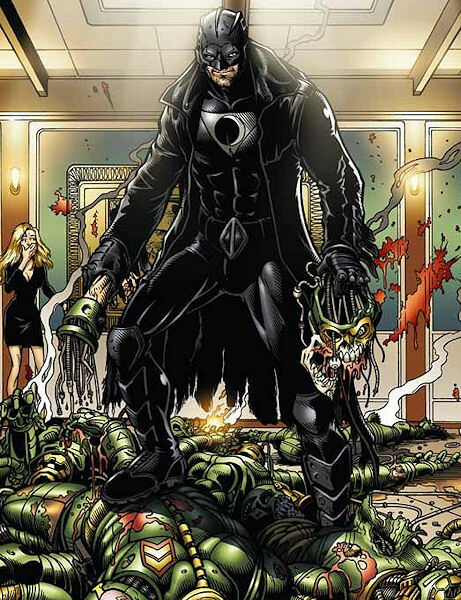 Powers/Abilities: The Midnighter automatically analyses every situation he is in as a combat scenario, his computerised senses instantaneously checking out multiple battle strategies until he has located the best one to win the fight at minimal effort. To aid him in the actual fight he has heightened reflexes and strength, and a superb knowledge of most forms of combat. 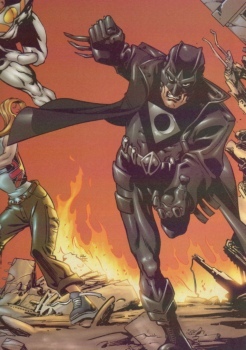 In addition Midnighter has superhuman durability, and is designed with a number of redundant systems (it was recently revealed that he even has a "back-up heart"). History: "Let me make this situation clear for you. I know what special abilities you have. I can see the enhancements. I can detect the increased electrical activity in your brain. I know what moves you're preparing to make. I've fought our fight already, in my head, in a million different ways. I can hit you without you even seeing me. I'm what soldiers dream of growing into. I'm what children see when they first imagine what death is like. I'm the Midnighter." 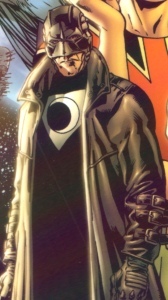 The Midnighter was a secret product of the labs of Henry Bendix, part of his Stormwatch "Academy" program, the members of whom were duped into becoming Bednix's personal Stormwatch team. One of many individuals given superpowers by that ruthless personage, he lost his original identity in the process. He was transformed into "Night's Bringer of War", a living weapon designed to "hit thing's until they don't work anymore. That was the skill that was built into me." Apollo and the Midnighter survived an illegal mission to steal vital medical technology, during which the rest of their team mates perished. The two lovers lived rough on the streets for five years, with Midnighter using the time and experience to hone his abilities. Eventually they were drawn out of hiding by their desire to right the wrongs of the world, and came to the attention of Jenny Sparks. Shortly after that they joined the newly formed Authority. Comments: Created by Warren Ellis and Bryan Hitch. Thanks to Chris "Doc TOC" Halliday for providing clarifications on this character's origins.